When wood or decorative concrete gets wet… It’s Slippery. But now you can keep the beautiful surface and make it safe with Safe Tread Clear. This 100% Acrylic formulation bonds tightly to a wide range of surfaces and is applied at only 150 to 225 square feet per gallon. Heavy traffic areas may require the 150 square feet per gallon application rate. Safe Tread Clear stands up to the weather because this formulation repels water and will not water whiten as many other clear products will. Special UV blockers help prevent ultra violet deterioration of the substrate as the sun shines through. Safe TreadClear is unique anti slip coating because it allows the decorative look to show through. You no longer have to sacrifice beauty for safety. The Hospitality Industry is especially concerned with safety, but they want a product that blends in with their decorating scheme. Industrial looking safety coatings just don’t have the beauty and warmth that can be achieved with Safe Tread Clear. Public walkways can be smooth and a danger when wet. Safe Tread Clear is unobtrusive yet gives great safety to wet areas. Natural wood decks are beautiful when the sun is shining, but can get real slippery when wet. Safe Tread Clear maintains a safe footing in wet conditions AND helps keep the surface cleaner because mold and mildew can’t get a foothold as easily as they might in uncoated wood. Safe Tread Clear protects both the substrate and the pedestrians. Slip and fall accidents are a major liability. The application of Safe Tread Clear can reduce liability and at the same time beautify and protect the substrate. 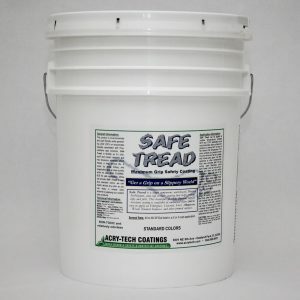 NEW, Clear Safe Tread Formula makes decorative, stained concrete or natural wood surfaces safer. You get a NON SKID surface while allowing the beauty of the underlying surface to show through. Now you can get great NON SKID properties for less than $0.45 per square foot. When applied evenly and at the recommended rate, Safe Tread Clear imparts almost NO color onto decorative wood or concrete surfaces. Angular sheen may be reduced somewhat due to the non skid particles but the beauty of the underlying surface will shine through. Heavy applications can result in some opacity especially when viewed from a low angle. For that reason, Safe Tread Clear is designed to give great traction with only a light application required. The Coarse Grit version is ideal for applications where pedestrians will have their shoes on. It can be a little abrasive to bare feet. 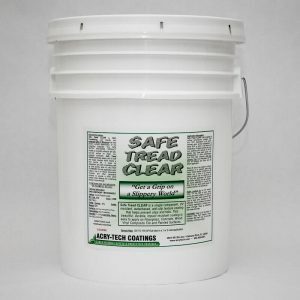 For a product better suited for bare feet – use our Safe Tread Clear – Fine Grit version. Safe Tread CLEAR is Self-Crosslinking, user friendly and enhanced with UV Blockers that help prevent sunlight deterioration of the underlying substrate. This NON WATER WHITENING PRODUCT creates an incredibly effective anti-slip, non-skid surface on clean, dry, prepared substrates. Safe Tread CLEAR penetrates deeply and is scuff and impact resistant which means a long service life. It cures by evaporation and air dries quickly while it’s also NON FLAMMABLE for safe application even indoors. Use it on Wood, Decorative Concrete and other decorative surfaces to provide a NON SKID surface while allowing the underlying beauty to show through. CONTAINS NO HAZARDOUS OR HARMFUL SILICA! Toxicity: NON-TOXIC and relatively odorless. Spread Rate: 150 to 225 SF/Gal total in 2 coats for maximum longevity. 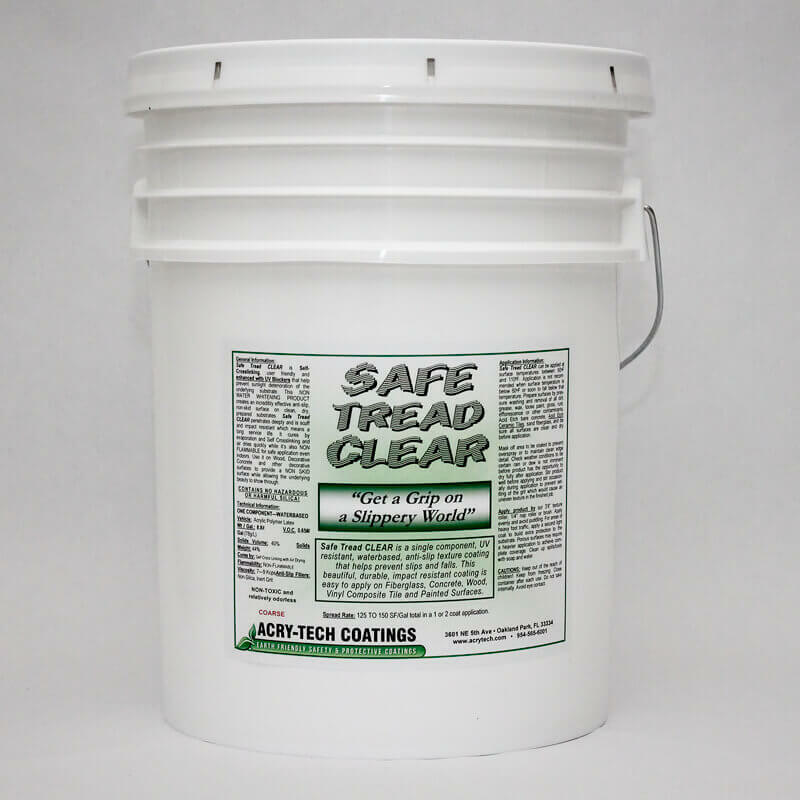 Safe Tread CLEAR can be applied at surface temperatures between 60°F and 110°F. Application is not recommended when surface temperature is below 60°F or soon to fall below that temperature. Prepare surfaces by pressure washing and removal of all dirt, grease, loose paint, rust, efflorescence, dead wood fibers or other contaminants. Etch new concrete after 30 day curing, lightly sand fiberglass gel coat. Ceramic tiles must be acid etched to remove the glassy finish prior to coating. All surfaces must be clean, dry and “paint ready” before application. 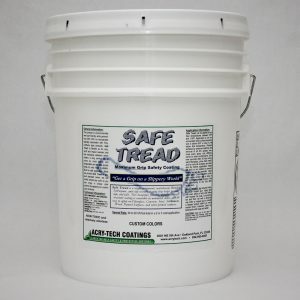 Stir Safe Tread Clear to incorporate all the non skid particles and create a homogenous material. Stir again if product sits without agitation for one hour. Mask off area to be coated to maintain clean edge detail. Check weather conditions to be certain rain or dew is not imminent before product has the opportunity to dry fully after application. Stir well before using. Apply product evenly with a ¼” to ½” nap roller or quality paint brush. Dilute if needed with clean water and dilute sparingly. For heavier traffic areas, apply a second coat when dry to the touch. Clean up spills and tools with water. To clean the surface and maintain the beauty of Safe Tread CLEAR, light pressure rinsing is generally sufficient. If needed, use general purpose cleaners such as: Tri Sodium Phosphate (TSP), Laundry Detergent (Tide Powder), Citrus Orange Cleaners, Formula 409, Simple Green or similar type products to remove oily deposits or other foreign matter. For best results apply cleaner at recommended dilution rate and scrub lightly with a stiff bristle deck brush. Rinse thoroughly when cleaning is complete. Great product. Would recommend to anyone. I specifically used the fine grit on my interior wooden stairs. It is hard to see, the wood grain shows through, and my stairs are now safe. I have peace of mind for my pregnant wife considering that we had both slipped on them previously. Great customer service as well! !